Foster Twelvetrees is a struggling tragedian who scrapes a living by giving hammy performances from the classics. He can hardly believe his luck when he’s invited to give a dramatic reading at the country home of a well-off family. But joy soon turns to outraged horror when he discovers dead bodies, foul intentions, lots of snakes and a madwoman in the attic. Can he uncover the hidden family secret before he comes to a terrible end..? Comedy legend Frankie Howerd stars as the victim of sinister shenanigans in this wacky parody of seventies British horror films. 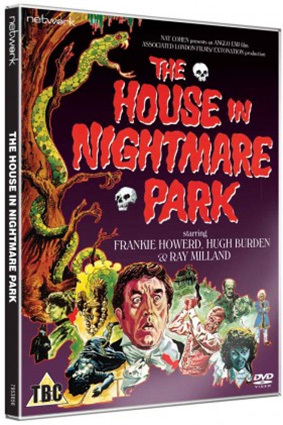 Directed by Peter Sykes, the man behind Demons of the Mind and To the Devil a Daughter, and starring Hugh Burden and Oscar winner Ray Milland, The House in Nightmare Park (1973) will finally be made available on DVD in April with a brand-new transfer from original film elements in its as-exhibited cinema aspect ratio.